In our childhood home my brother Michael, and my sister Pammy and I would get all dressed up and be ready to go trick or treating every October 31st by about 2:30 pm. Of course, that was far to early to start knocking on doors, so with precision we would race downstairs to watch the original 1989 version of Batman. I'm pretty sure it was the scariest movie we owned. Two hours later it would be 4:30 pm, the sun would be starting to set, and now there was only one thing between us and our candy: Sloppy Joes. My mom made Sloppy Joes every Halloween without fail; even when it was just me left in the house to celebrate, my mom still made me Sloppy Joes. I never remembered caring as much about our costumes, or our route, as I did about Batman and Sloppy Joes. In fact, even after Michael grew too old to accompany Pam and I Trick or Treating, the three of us would still gather together to watch Batman and eat Sloppy Joes. I wish he was here to watch Batman and eat Sloppy Joes with us this year. *Tip: The Puff Pastry for the September Daring Bakers Challenge worked perfectly! A Whisk and a Spoon has the recipe posted; or you can use store bought of course! 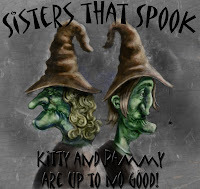 This delightful scary drink is from my sister Jill's archives! She is so clever! Opt for Cherry 7-up for a bloody effect! The fizz of the 7-up combined with the citrus of the orange juice creates a fabulous sherbet like flavor. *Tip: The Dollar Tree has $1.00 bags of spider rings, simply cut off the ring portion, leaving the spider intact. Now that you know how to make your cauldron simmer, race over to Pammy's blog to learn how to make your dinner table glow with her festive tricks, and learn what was for dessert! Our Halloween dinner was chili and cornbread. Great memories. Amazing how many memories are tied to food. Fantastic blog. 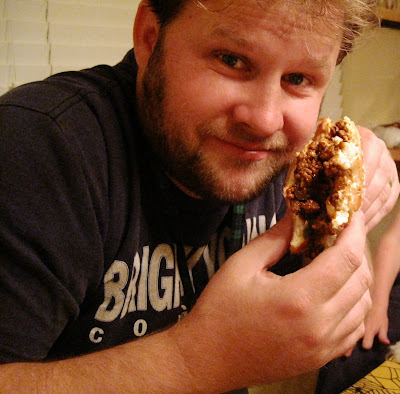 But what is with that goofy looking dude holding the sloppy joe? This was such a goblin good meal. 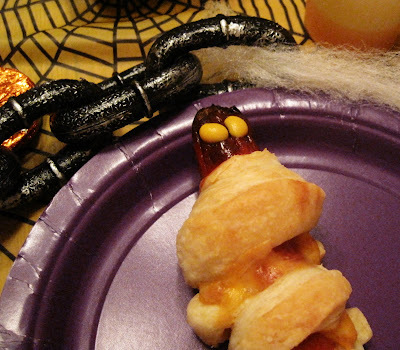 Loved the hot dogs ~ ghostly great!! Yum! Unfortunately, we are trying to go vegetarian, so maybe I will try this with morningstar meatless hamburger crumbles...ick. Visiting from SITS... what a great blog you have here! I am now a follower - I am going to try and make that pumpkin cake this weekend... it looks scrumptious!! Ditto to what every else is saying. I love this time of year and am super excited to make all your fun treats! We miss you guys! I hope all is well. I really don't like sloppy joes, but your recipe looks good! Maybe I'll give it a try! Those hot dogs are smashing! And teh spider cubes. I already copied them. You are sooooo clever. 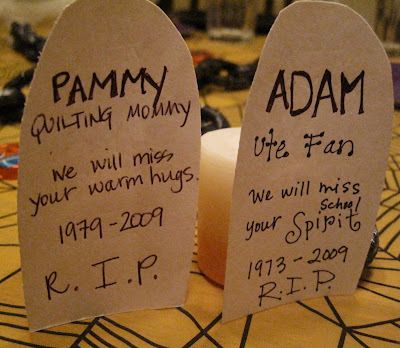 I love these fun posts that you and Pam are doing. Thanks especially for the carmel apples with video -- I'd love to try them this year! Sloppy Joes is a great tradition for Halloween! 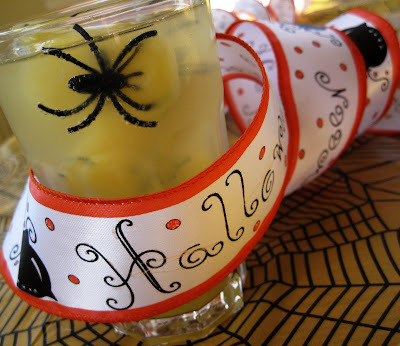 We are having a Halloween party this year - haven't done that for years - your ideas are so fun and so real! Thanks! We use to eat sloppy joes on Halloween too! They are one of my favorite comfort foods! I like all these clever holloween ideas. This ice cube one is great! 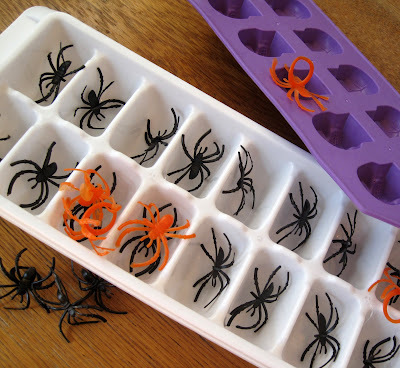 I think the spiders in the ice cubes are a great idea!